BATANGAS, Philippines – Miss Earth Brazil Sayonara Veras extended her stay in the Philippines citing warmth and remarkable hospitality as primary reasons. With only 3 days left in the country, she visits Playa Calatagan in Batangas. 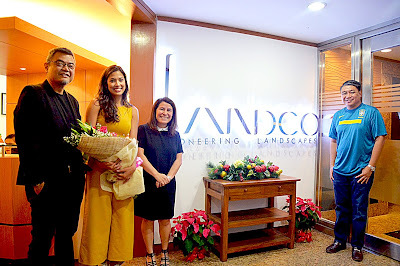 She made a courtesy call to the management of Landco Pacific Corporation where she was greeted by CEO and President Maria Cristina M. Zuluaga, Managing Director Erickson Manzano, and Vice President Gerard Marcelo.